Right in front of Ross Stripling’s locker was a bright pink suitcase. Dodger players were given free suitcases during the Freeway Series. Stripling was the last to grab his and it was the only color that was left. “I can’t say it’s not easy to notice in the baggage claim,” Stripling said. 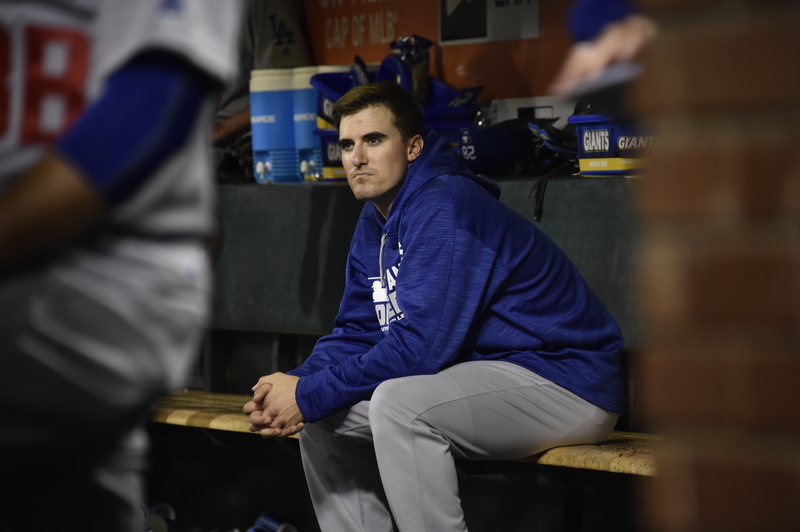 Even without the suitcase, Stripling has the humility to realize that his moment on April 8 won’t last forever. His 7 1/3 no-hit innings against the Giants in San Francisco gave him overnight fame. And the day after, he was removed from the marquee. But this memory was so good it had some life. 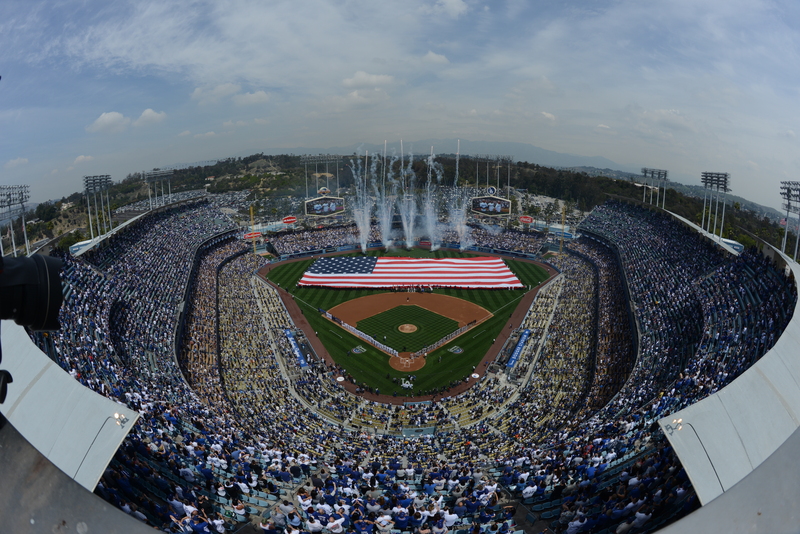 Stadium and auto gates will open at 10:10 a.m. Tuesday for Opening Day at Dodger Stadium. Beat the traffic by coming to the game as early as possible, consider the many alternate transportation options and make sure you prepay your parking in advance to save time and money if you do drive. The Dodgers and the Los Angeles Police Department are spreading the word that fans should not park on the Avenue of the Palms (Stadium Way) between Scott Road and Academy Road. This street will have a “No Parking” restriction from 5 a.m. to 5 p.m. In addition, in order to keep all attendees safe, LAPD officers will be patrolling the area and will enact a zero tolerance policy for drinking in public or in the parks. 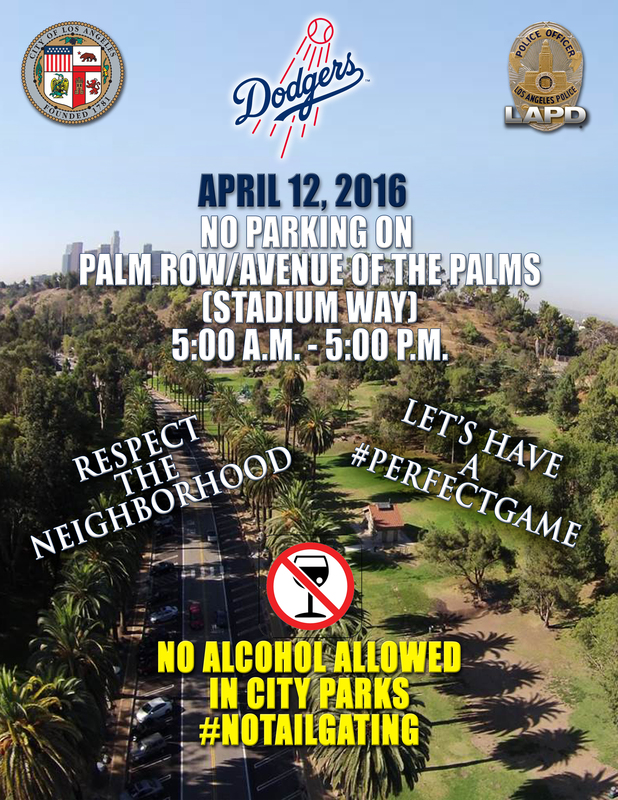 Tailgating also is not permitted on the Dodger Stadium premises. The Dodgers and the LAPD wish everyone a safe and fun-filled day of baseball, and ask fans to respect the neighborhood and stay safe. Every season, every single season in this glorious era of Clayton Kershaw, it’s impertinent to ask whether he can top himself. How can you demand more of someone who has perched at the summit so long, we’re all losing oxygen? It seems gauche even to hope Kershaw can match his performance from previous years, during which he led the Majors in ERA for four of the past five seasons and had a 1.99 FIP in the year he didn’t. And yet out comes Kershaw in San Diego, into the gloaming as he begins what unbelievably is his ninth big-league campaign. And as he has he before, he picks up the thread from the last season like it is one continuous stitch. In the last meaningful regular-season game he pitched in 2015, he allowed one hit and one walk, pitching the Dodgers to a National League West-clinching victory. 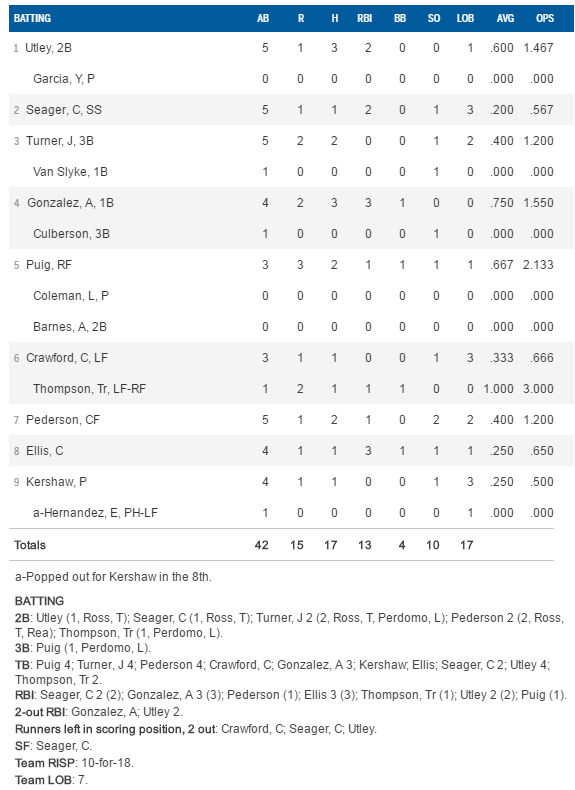 In his seven innings tonight, while the Dodgers built a 15-0 lead, Kershaw allowed one hit and one walk, pitching the Dodgers toward a sixth consecutive Opening Day victory. Presenting the #Dodgers 2016 #OpeningDay lineup. Not that this move needed defending, but Dave Roberts explained his choice to bat Corey Seager second, saying that Seager a) was a good matchup with Padres starter Tyson Ross, b) would give good at-bats and c) had the experience of batting high in the order during last year’s National League Division Series. Roberts also noted that Seager was not up there to bunt. As for Chase Utley batting leadoff, Roberts said that he trusted the veteran’s at-bats and believes he can get on base. Howie Kendrick is soon moving back to live batting practice and continues to aim for a return to active duty at next week’s home opener. The Dodgers are facing five straight right-handed starting pitchers to open the season, but Roberts said right-handed batters Kiké Hernandez, Scott Van Slyke and Trayce Thompson would see action before they presumably start against Madison Bumgarner in San Francisco on Saturday. One quirk I liked about this year’s lineup: It’s the first in Los Angeles Dodger history where all four infielders batted before all three outfielders (with the catcher and pitcher finishing things off). Do you think of Petco Park as a tough place to play for the Dodgers? Los Angeles has won the majority of games there for five consecutive seasons, going 30-17 (.638) since 2011. Here’s a profile of Ross from Dennis Lin of the San Diego Union-Tribune. 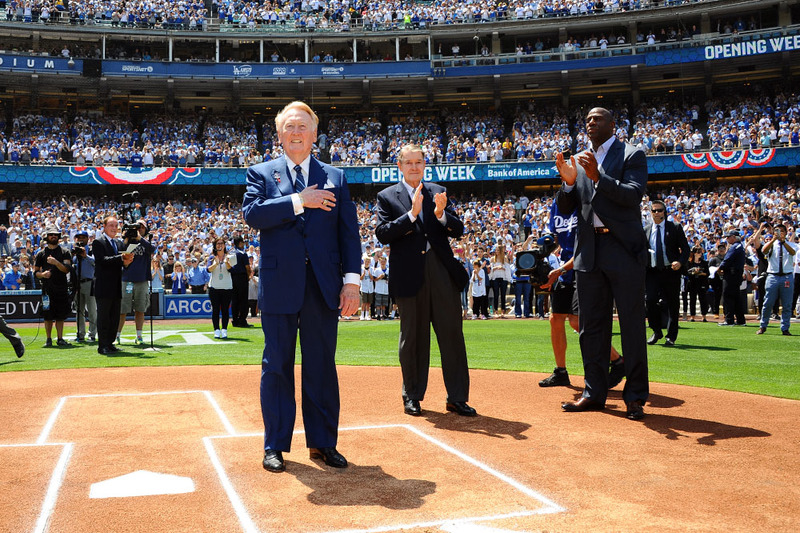 The Dodgers are 31-27 on Opening Day since moving to Los Angeles in 1958. 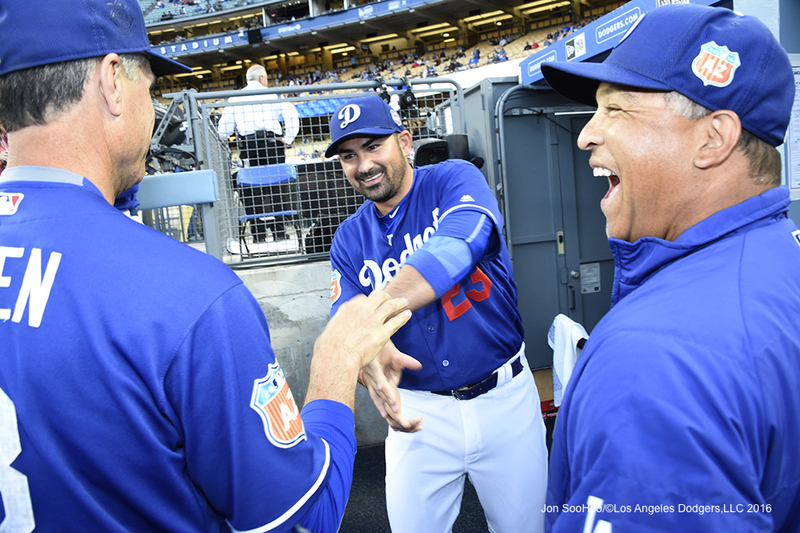 With five consecutive Opening Day wins, the Dodgers and Orioles have the second-longest active streak in MLB, behind Seattle (nine). 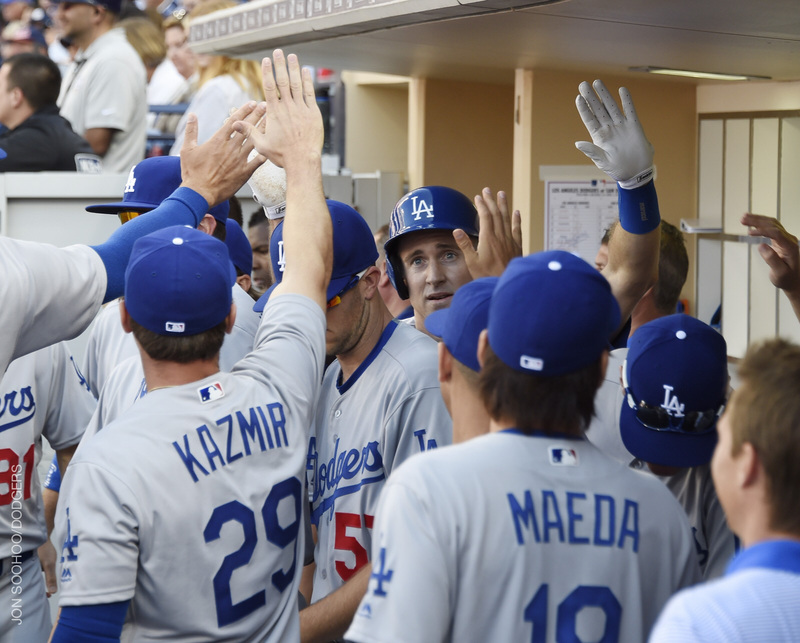 The Dodgers have an active six-game win streak against the Padres. The last time the Dodgers beat the Padres seven times in a row was when they won 16 in a row over the Padres from September 9, 1973-September 20, 1974. Clayton Kershaw’s career Opening Day ERA of 1.14 is the second-lowest in the big leagues for pitchers with at least five season-opening starts since 1920, behind Rick Mahler (0.92). Austin Barnes, Louis Coleman (who turns 30 today), Ross Stripling, Kenta Maeda, Seager, Thompson and Hernandez will take part in their very first Opening Day. Roberts and Padres manager Andy Green form the first Opening Day meeting of two rookie managers since Fredi Gonzalez (Florida) and Manny Acta (Washington) in 2007. Pitching matchups for the next two nights: Scott Kazmir vs. James Shields on Tuesday, Kenta Maeda vs. Andrew Cashner on Wednesday. Dodgers at Padres, 4:05 p.m. Watching Madison Bumgarner of the Giants issue a bases-loaded walk in the first inning today grooved me to remember not to invest too deeply in Opening Day. That RWI was the set-up to a punchline. The next batter hit into an inning-ending double play, and as far as I was concerned, baseball began being baseball right away in 2016. And we’ve got a lot of baseball ahead of us. 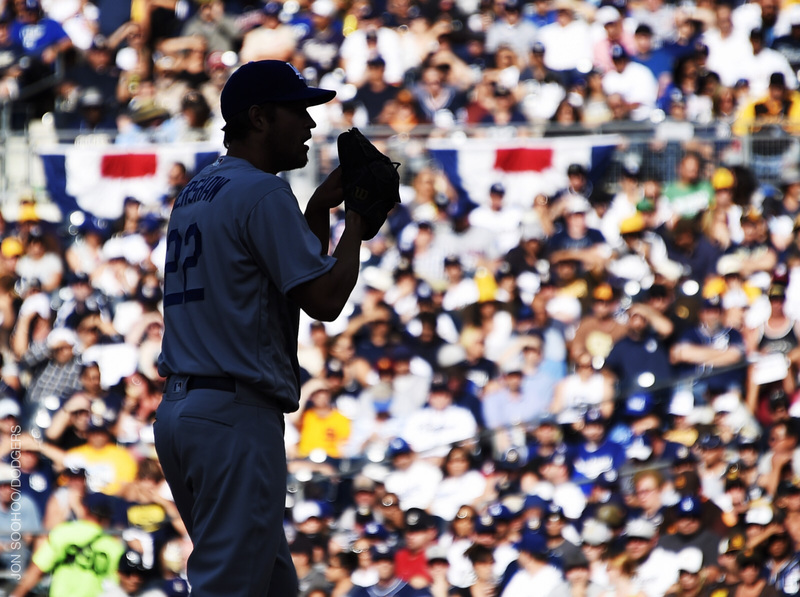 Clayton Kershaw opens the 2014 MLB season in Sydney, Australia. 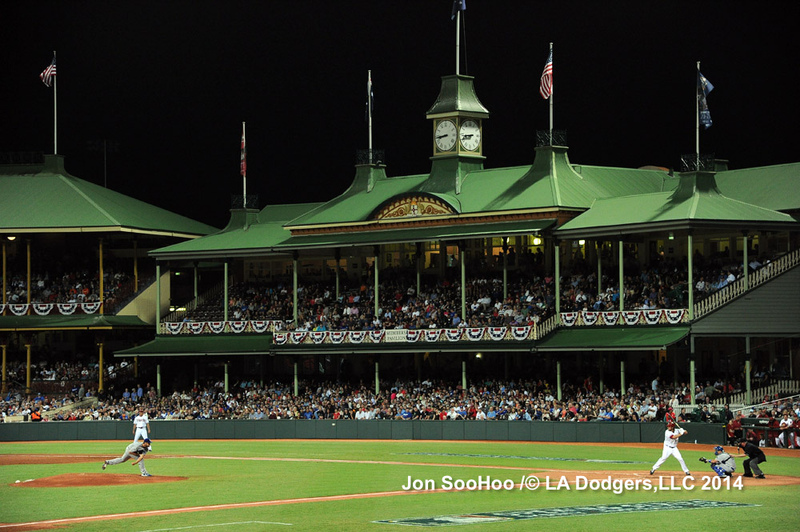 Since 1988, the Dodgers are 8-6 when they’ve opened the season on the road, including their farthest trip, which delivered a 3-1 victory over the designated host Arizona Diamondbacks in Sydney on March 22, 2014. In San Diego, where the Dodgers begin the 2016 season Monday, the Dodgers won season-opening games at San Diego in 2009 (behind Hiroki Kuroda) and 2012, with Josh Lindblom getting the win after illness forced Clayton Kershaw from the game after three innings. Before that, believe it or not, the only time the Dodgers opened a regular season in San Diego was 1973, when a three-run eighth lifted the Padres over Don Sutton, 4-2. Sutton got revenge the following year, winning 8-0 at Dodger Stadium over the Padres on Opening Day 1974.